Ingrown hair is a problem that can affect both men and women though the areas affected tend to be different. The most common reason that hair gets mixed up and grows inwards rather than outwards is due to shaving or waxing. These hairs can create sore and ugly lumps and bumps – but they can be dealt with, and steps are taken to ensure they don’t return. When hair grows the wrong way, a bump will appear, sometimes a small group of them if more than one hair is causing the problem. They look a bit like pimples and can even create a boil-like sore. Often, they itchy and are uncomfortable, especially if there is a cluster and they can have pus inside them due to an infection. For men, the most common location for ingrown hairs is the face and neck area – where they shave. Likewise for women, under the arms and the legs are common areas as well as the bikini line and anywhere else that they shave or wax. Any type of hair can become ingrown, but those with curly or coarse hair are a little more likely to experience it. Once you notice that lump or bump, then you need to take action. If it isn’t already, the lump can become infected and cause pain and discomfort. There are lots of different ways to deal with ingrown hairs but the easiest solution is to use a simple process to remove them then special products to prevent them reoccurring. Aloeclear has an anti-inflammatory and anti-bacterial action and reduces swelling caused by ingrown hairs in just a few hours. The hair will then be nearer to the surface of the skin and Aloeclear’s exfoliating action will bring the hair to the surface. In severe cases where the ingrown hair is quite long, you may need to use a sterilised needlepoint tweezer to help the hair emerge once it can be clearly seen at the surface. Of course, it is always better to prevent the ingrown hairs rather than treating them, and there are some good ways to go this. Exfoliating the skin before you shave is a great way to reduce the chance the hairs grow the wrong way. One cause of ingrown hairs is skin flakes blocking the pores and causing the hair to grow the wrong way. By exfoliating, you can remove the loose, flaky skin and ensure it doesn’t cause the problem. There are also special products designed to help soothe the skin and prevent ingrown hairs. 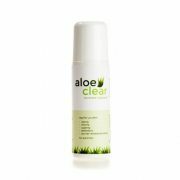 Aloeclear contains aloe vera, an ingredient that is known to have anti-inflammatory properties and to sooth and calm the skin. It is an ideal defence against ingrown hairs as well as razor bumps and burn and should be used straight after hair removal as it moisturises, exfolliates and cools the skin. The range also includes specialist products for other areas of the body including for the bikini line and a small roll on variation that is perfect for men to use after shaving. Ingrown hairs are uncomfortable and look awful, but they are curable and are also very preventable. Using the right treatments and products can prevent these uncomfortable lumps and bumps and make it easy to shave without the concern of those mixed-up hairs coming along afterwards.